Business practitioner with 20 years’ experience in sales management, private healthcare management and customer service. Consultant and Business Trainer, focusing on company development strategy and effective leadership. Medical doctor, specialist in Family Medicine. Graduated Wroclaw Medical University, Health Care Company Management from Kozminsky Uniwersity in Warsaw and Management Trainer School based on Management Consultants and Trainers Association MATRIK in Cracow. Joanna’s professional knowledge and experience are deeply rooted in working for international companies, were she was responsible for building high performance teams, implementing marketing plans in sales, and overseeing all team members’ activities at the regional and national level. 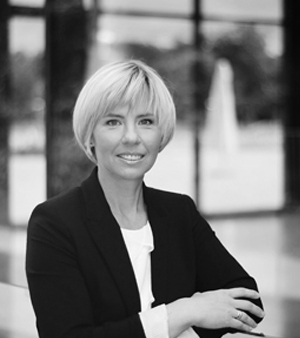 In 2004, Joanna received Award of Excellence in recognition of significant contribution to the long term growth of Abbott Poland in the category of Inspiration and Knowledge Sharing. She was also responsible for Private Medical Centers’ development strategy on the health care market. Joanna took part in multiple projects on quality development, customer service improvement, and leadership skills development for subordinate managers. She completed numerous courses related to managing, consulting, and training. Joanna specializes in developing managerial competences, teambuilding and team management, effective communication in business, stress and conflict management, customer relationships development, age and diversity management, and work-life balance. In her consulting profession, Joanna performed more than 50 organisational diagnoses, consultancy and development projects – mostly for IT, medical, finance, and insurance industries. Key note speaker on local and international conferences. Joanna asks questions, listens to others’ point of view, helps to solve problems, identifies new trends, supports managers, communicates openly, sets challenges, develops new approaches, motivates, inspires! She works in Polish, English, and Russian. Podobała mi się duża interaktywność i podążanie za dyskusją uczestników. Było to bardzo ciekawe obserwować tak dobrego trenera w akcji.